Is this interrupt configuration on Cobb BSC? Hi all. I am being tuned by Will at PD. He suggested I get a 3 port EBCS. 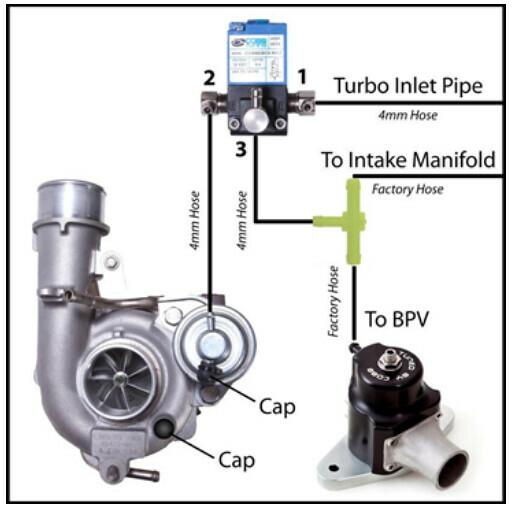 I bought a Cobb and while looking at the installation instructions it does not specifically say "interrupt" and I want to make sure this is the correct diagram before I install and take the car out for a datalog. Yes if the #2 is the common port, #3 is NO and #1 is NC. Keep your hose as short as possible and using the bottom port instead of the top permit the use of a larger hose too. Cobb does not have the ports labeled, but I think this is correct, I did email cobb today but I have not heard back yet. you can confirm it by checking where the air pass thru. just be careful not to mix common and NO because it will still seem to work with a bad response.